Leon Deschamps, 32, said he wants to show that the sharks are not merely blood-thirsty killing machines and was prepared to put his own life at risk to prove it. The conservationist from Shark Bay in Western Australia said: people perceive all sharks to be the same and that tiger sharks are victims as a result. 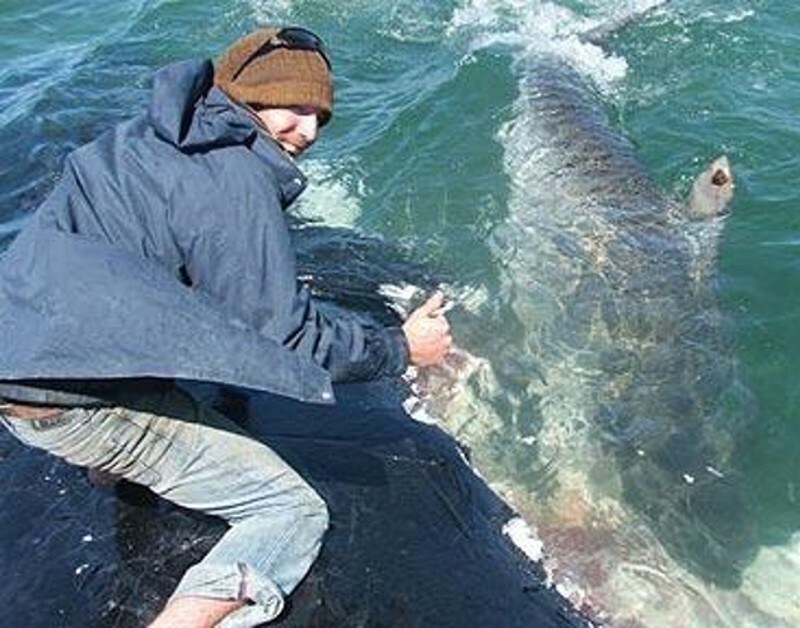 “We fear sharks because we do not understand them,” he said. “They are lumped into the same group as great whites and bull sharks, just because they are a type of shark, but their feeding and predation habits are completely different. “We must be more species specific when we talk about sharks. “I want to bring the animals into the public arena, educate people so they know they are not blood-thirsty killing machines. He added: “Feeding is a time when they are supposed to be at their most ferocious. But I think they quite enjoyed me stroking their noses. Deschamps insists the stunt was spur-of-the-moment and strongly warns people not to attempt the same feat. He said: “I heard about the whale carcass from fishermen coming back to shore. Me and some friends traveled through the night on a Catamaran and arrived early the next day. We were the first to arrive and saw the sharks in an eating frenzy. “It was totally spur-of-the-moment, but I knew it was safe. It was because it was not a planned event that made it so special. “You must remember that the whale was grounded, beached in about one meter of water. I was stable. Great whites can jump and do so to get their prey. Tiger sharks don’t. “It was the safest time I would ever get to touch these animals during feeding. “I wasn’t scared because I have educated myself about the animal. A spokesman for Australia‘s Department of Environment and Conservation warned that touching whales was illegal and people were not to interfere with sharks because of the risk of attack. Enjoyed having their noses stroked … do you think they noticed? Like a pet dog … do you suppose they come if you whistle? This entry was posted in people and tagged Australia, Fish, Leon Deschamps, man sits on whale, Shark, Shark Bay, shark feeding frenzy, Tiger shark, Western Australia, Whale, Whale shark. Bookmark the permalink.